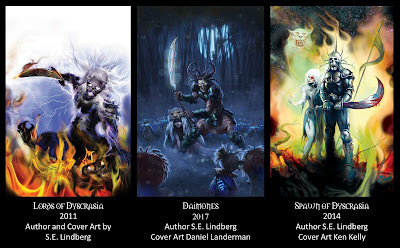 Wow, Black Gate Magazine just featured Lords of Dyscrasia on Jan 15th! This was in part inspired by meeting John O'Neill at the World Fantasy Convention. That was a great time, especially when Black Gate received a WFC 2016 award! To clarify, the artwork (50+ illustrations and cover) for Lords of Dyscrasia were done by me, by for the sequel Spawn of Dysrcasia I commissioned Ken Kelly. Expect more Dyscrasia Fiction in 2017 as a bridging novel emerges, with cover art by Daniel Landerman. Daimones focuses on Helen's growth from an orphan into one of Lord Lysis's acolytes. I really enjoyed Joe Bonadonna's Mad Shadows: The Weird Tales of Dorgo the Dowser (review) which appeals to dark fantasy and weird fiction fans; Dorgo really is a superb blend of mystery and adventure. 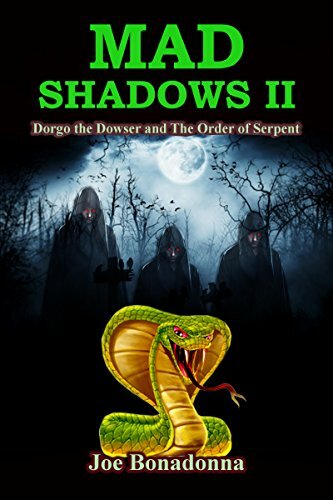 It is my pleasure to help announce his recently released sequel Mad Shadows II: Dorgo the Dowser and The Order of the Serpent available now! Shown below is a treat, since cover artists Erika Szabo also created a map of Aerlothia and we have it here! Synopsis: Dorgo the Dowser lives in a world where life is cheap and souls are always up for sale. Armed with a unique dowsing rod that can detect the residue of any supernatural presence or demonic entity, he can sense the vestiges of vile sorcery used in the commission of crimes. His adventures pit him against inter-dimensional creatures, friendly ghouls, raging cyclopes, psychopathic satyrs, and monstrous insects . . . not to forget a criminal underworld of duplicitous women and dangerous men. This time around, Dorgo falls in love with a witch known as the Girl Who Loves Ghouls, battles creatures from another dimension, and meets one very special werecat named Crystal. It’s also the first time he hears about an ancient death cult known as the Order of the Serpent. Then, after a young woman is murdered and a deadly, dangerous book of arcane lore is stolen from her, Dorgo comes closer to learning more about this secret Order. But first he must battle both humans and demons in order to find and destroy “The Book of Echoes.” Finally, Dorgo squares off against a horde of fiends born of dark sorcery when he tries to help a young girl who became trapped inside a powerful spell while attempting to destroy someone calling himself Ophidious Garloo. Racing against time, Dorgo the Dowser uses every trick he knows to uncover the secret identity and learn the True Name of Ophidious Garloo -- the Undying Warlock who may very well be the leader of the Order of the Serpent. JOE BONADONNA : Joe Bonadonna is the author of the heroic fantasy Mad Shadows: The Weird Tales of Dorgo the Dowser, published by iUniverse; the space opera Three Against The Stars, published by Airship 27 Productions; and the sword & sorcery adventure, Waters of Darkness, in collaboration with David C. Smith, published by Damnation Books/Caliburn Press. 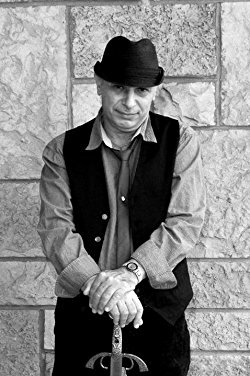 His latest novel, Mad Shadows II: Dorgo the Dowser and The Order of the Serpent has just been published by the author. He also has stories appearing in such anthologies and shared-universes as: Azieran: Artifacts and Relics, published by Heathen Oracle; GRIOTS 2: Sisters of the Spear, published by MVmedia; Heroika:Dragon Eaters; Poets in Hell; Doctors in Hell, and the forthcoming Pirates in Hell — all published by Perseid Press; and Sinbad: The New Voyages, Volume 4, published by Airship 27 Productions. 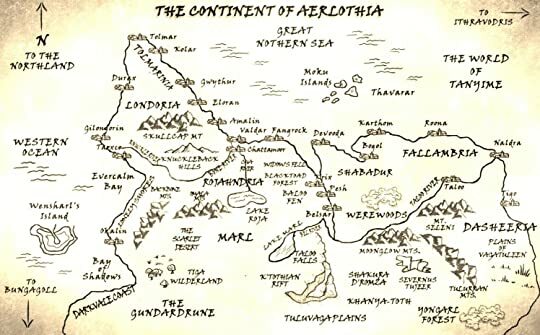 His next novel, The MechMen of Canis-9, is scheduled to be published by Airship 27. He will have stories appearing soon in the shared-world anthologies Sha’Daa, in collaboration with Shebat Legion; and The Lost Empire of Sol, in collaboration with David C. Smith. In addition to his fiction, Joe has written a number of articles and book reviews for Black Gate online magazine, including the stories Queen of Toads, and The Moonstones of Sor Lunarum (from Mad Shadows 1), both of which can be read for free on Black Gate’s website. You can find Joe on Facebook and Google+ , otherwise visit Joe’s Amazon Author’s page (link) / or check out his blog, at: www.dorgoland.blogspot.com. Be civil and leave your inner savage... is our group's mantra. Who is there and why? 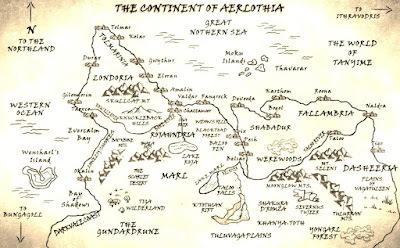 Readers, authors, illustrators, and editors discuss Sword & Sorcery books and related media (movies, comics, blogposts, etc.). 1) Please do initiate conversations! Groupreads are staggered: 2 months periods...and two topics each. About half way thru, we'll poll to identify the topics for the next period. Final results are emailed ~1week prior, but the polling status can be seen on the group's homepage at anytime (bottom). We never delete/archive discussions (Groupread topics or otherwise), so many previous discussions are still available ... and its perfectly fine to continue/resurrect those even if they are years old.